Take an XW-P1 and add an iPad and it opens a world of possibilities. 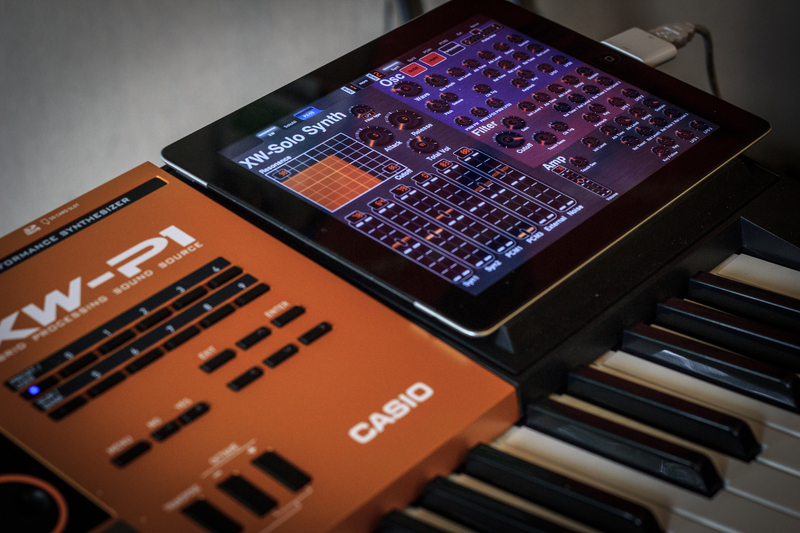 We’ve discussed how to use the XW-P1 to drive software based instruments – this app is controlling the Solo Synth on the XW-P1. Which app? How is this possible? More details coming, we’ll be showing this at the Summer NAMM in Nashville next week. This entry was posted on July 2, 2013 by MikeMartin. It was filed under iPad, iPad, Solo Synth, Solo Synth, XW Synths and was tagged with Apple, Casio, iPad, NAMM, Solo Synth, Summer NAMM, XW-G1, XW-P1. only iPad? any other devices with android? Only iPad. Android does not support MIDI so it is unlikely you’ll get apps such as this on that platform anytime soon. My intent at first was to have my G1’s sequences play on the Kaossilator, but i dont know if i can actully do it the other way around. Play the Kaossilator sounds and effects on my G1 by downloading the app on an Ipad and using it as midi. What do you think? First of all I praise Casio for making this App available for these incredible synths its an welcome addition to delve these synths visually, Is there a chance for windows tablets support for this App if all go’s as expected. Thanks. Hi Mike when the app should be available on the app store? Free or? It will be free. No release date yet. Hopefully within the next few weeks. Can’t wait! Keep us updated! Any idea on when this app will be available? I bought MIDI Designer Pro. Would it be possible to build the app inside of it (or at least mimic the app), and how difficult would it be? Is there any update on the MIDI Designer template? We will be releasing the layout for MIDI Designer Pro this week. The layout in a Casio specific app will be submitted the App store in few days too. Too cool. Thanks for the update.